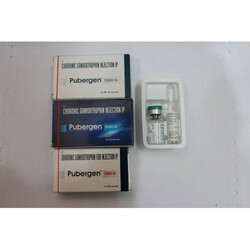 Offering you a complete choice of products which include enoxaparin injection ip and pubergen progesterone injection. 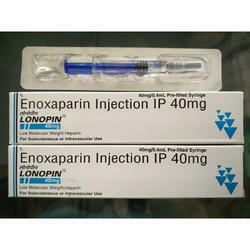 Enoxaparin is used to prevent blood clots in the leg in patients who are on bedrest or who are having hip replacement, knee replacement, or stomach surgery. It is used in combination with to prevent complications from angina (chest pain) and heart attacks. It is also used in combination with to treat blood clots in the leg. Enoxaparin is in a class of medications called low molecular weight heparins. It works by stopping the formation of substances that cause clots. To attain the altering requirements and desires of our patrons, we are enthusiastically immersed in offering to our patrons a superior grade collection of Pubergen Injection. In complete compliance with the standards of excellence pre-set by the industry, these could be availed from us at most affordable rates. Also, these are shipped after getting packed in premium quality packaging.